The Definitive Edition of Tomb Raider is now available on both the PlayStation 4 and Xbox One. This is Square Enix’s attempt to get Crystal Dynamics ready to rock on next gen machines while making a few extra bucks from a really well received, perhaps underselling effort. If you’re hungry for graphical comparisons and hardware performance analysis, then you might want to pay attention. Eurogamer has it from Digital Foundry that the PlayStation 4 version of the game pretty much stands ahead in FPS, a number that a lot of gamers point to as sign of hardware strength. Here’s a handy graphic from their article. The numbers are based on the video analysis you see at the head of this post. 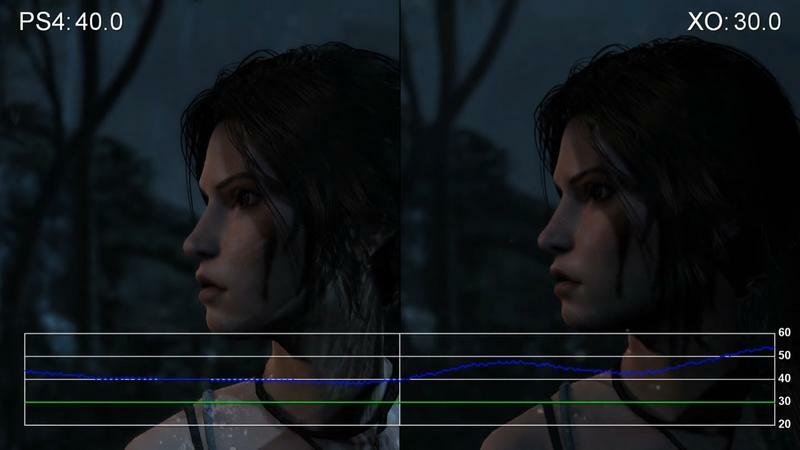 Yep, the Xbox One version of the game actually dips to 18fps during play at some points. The PlayStation 4 version lock in at 60 with dips, while the Xbox One version sits at 30fps and drops as well. In the lead up to this title’s release, a lot of bluster was shot off about how the Xbox One and PlayStation 4 versions of the game were exactly the same in performance. Seeing that, in play, the Xbox One manages to fall below 20fps is quite disheartening. Will you be picking up this “Definitive Edition” of Tomb Raider for a new console?